Panasonic Lumix DMC GF6 review: is WiFi and 16-Mpix sensor enough? At $599 including the 14-42mm f/3.5-5.6 II kit lens, Panasonic’s latest iteration of the entry-level, finder-less Lumix GF features a higher resolution 16-Mpix MFT sensor (up from 12.1MPix for the previous model) with sensitivity up to ISO 25,600. It also boasts a tilting, capacitive touch screen and built-in WiFi with the convenience of NFC (Near Field Communication) technology for simplified connectivity with suitably equipped smart-phones. 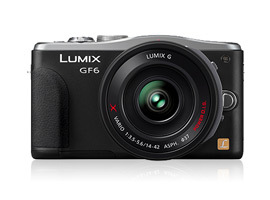 Panasonic has also returned to a more traditional layout complete with a shooting mode dial on the top plate, yet at the same time the GF6 adds an unusual jog-style zoom lever surrounding the shutter-release button (useful for the optional ‘pancake’ powered zoom). HD movie capabilities haven’t been ignored with 1080p30 stereo clips captured as either MP4 or AVCHD format. So, how well does this stack up in today’s competitive mirrorless market? 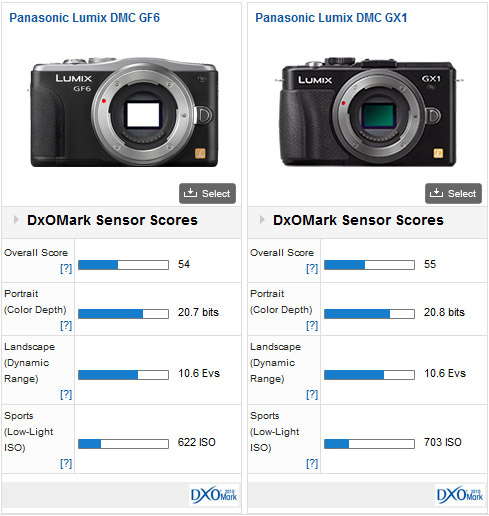 The Lumix DMC GF6 achieved a somewhat lowly DxOMark sensor score of 54 points, in fact very similar to the firm’s earlier Lumix GX1 model. 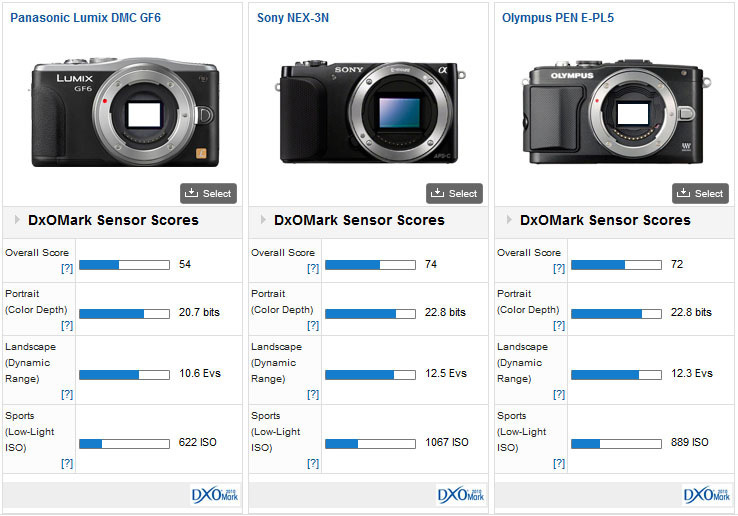 Unsurprisingly then, Sensor metric scores for Colour Depth (20.7 bits), Dynamic Range (10.6 Evs) and Low-Light ISO (622 ISO) score are uncompetitive when compared to the latest offerings from rivals. 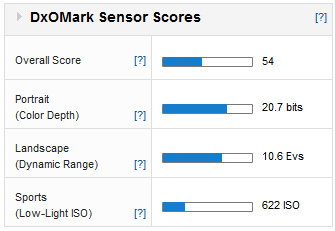 Trailing main rivals by 18-20 points on our DxOMark Sensor score, the older sensor of the GF6 is looking quite dated, and, as a result, the sensor metric scores make somber reading. Color depth is -1.33 stops under both cameras, while DR is close to -2 stops on average. While the camera’s feature set is similar this is a subpar result overall, especially against the similarly priced E-PL5 (given the same pixel count and equal size sensor). Indeed if price is a concern, at $499 including the 16-50mm kit zoom, the Sony is the ‘winner’ here. 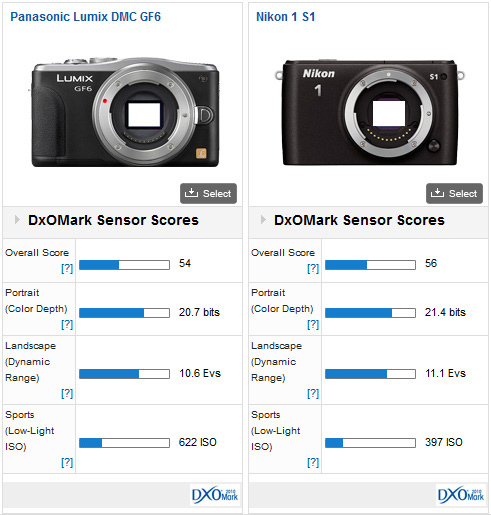 With just one point difference between the Lumix DMC GF6 and the much earlier (2011) enthusiast-oriented GX1 (and with it, correspondingly similar sensor metric scores), it’s safe to assume the two adopt the same sensor. Compared to the Nikon 1 S1 the GF6 doesn’t fare that well either, given the smaller (CX) sensor of the former. In fact, the two are surprisingly similar in performance terms though the +0.66 stop advantage of the GF6 in low light is not a surprise and genuinely useful. While the $499 Nikon (c/w 11-27.5mm kit lens) is the value choice between them, the sensor is a now somewhat lowly 10.1 MPix unit. As an entry-level camera the GF6 has some promising features but the imaging performance is sadly lacking, at least when compared with rival offerings adopting much newer and more capable sensors. If sharing (or even remote camera control) using the built-in WiFi feature is high on your list of priorities the GF6 appeals but based on sensor performance alone there are better choices available.